Daniel Trudeau's Pregnant project has always been one of the most beloved in the greater Sacramento region (being very liberal including Placerville). On occasion he comes down from the Foothills—the players vary—but his avant garde pop musings are always infused with the same nubile splendor, unfettered like the wild mushrooms that grow in the woodlands around his hometown. In Pregnant's decade-long run, he's always had a home away from home at Bows & Arrows, a local-run eatery/boutique/gallery/venue that closed its doors at the end of January. Naturally, Pregnant played one of the final Bows shows, debuting his most recent lineup of Daniel Ramirez (who will join him on a UK tour) and Molley Raney of Poppet. The set was nearly seamless; the accompanying members gave immediate life to Trudeau's recordings as he no longer had to build the track out with loops texture by texture. It was the sort of set that set the room a-buzz, renewing excitement for an old friend who'd been laboring over the same project for what feels like the majority of our adult lives. 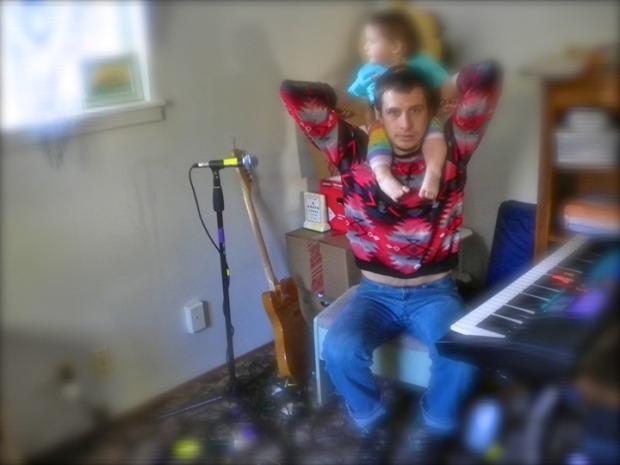 Soon Pregnant will release the Inconvenience LP on Porch Party Records. Given my recent experience, it is undoubtedly the most anticipated Pregnant record to date, one that will garner long-deserved praise for a project that feels as though it is arching towards its fullest potential. On “FOREHEAD” (feat. Evelyn Quijas & Sean Ongley), Trudeau's magical thinking is being passed along to his offspring, but it's presented as mystical knowledge we might also consider. In two sentences he conveys a charming game to keep a child's imagination strong, protecting it from the pain of divorce. In giving the psychic power to us, Trudeau assures us the gift of imagination does not have to be denied or lost entirely, but still has use as a coping mechanism. Pregnant is currently orchestrating a Kickstarter to fund its UK tour. It's nearing the goal, but would benefit from a boost as there are 45 days remaining. Pregnant began as a solo project and has gone through considerable evolution in its 10 years. Tell us about the current lineup and what looks to be a more collaborative vision with this record. The current line up is myself and Daniel Ramirez (Placerville native), one of the most legit musicians I have ever worked with (can literally play any instrument, just give him a room and an instrument). As well, we recently added Molly Raney of Poppet on vocals and keys/added ambiance. Ramirez plays a large midi pad (sample exclusive/not drums) as well as a midi keyboard and adds a considerable body to the tunes live and in recordings. This record's focus is moving more towards the aesthetic of artists like Max Tundra or Javelin, etc. but still retaining the old Pregnant stylings. I am really proud of it and stoked to work with the good people at Porch Party Records out of Long Beach. The label is new but I can tell it has a promising future. Very loving people are working on it with good taste and good intentions. The track “FOREHEAD” features Evelyn Quijas & Sean Ongley. How did you link up with them and are there more features on this record? Did Inconvenience take on a more collaborative process than previous records? “FOREHEAD” was the only collaborative part of this record. I met Evelyn Quijas at a FMLY Fest in LA a couple years ago and we have remained pretty good pals. It's actually really funny that she sang on it because she never really sings. I just love fruiting musicians when they think they aren't musicians. I have known Sean Ongley for almost six years now. I met him in Portland and he is big on Jazz. He's a 30-sum-odd old man that is stuck in a 70 year old's body. He just played sparce keys on the track that I edited. You can see what Sean does over at this link. Just thought his taste as a musician would work well for this track. He was in town from Portland doing this podcast interview tour so I had him help. He's amazing. The record is called Inconvenience. Care to elaborate on the title and its significance to the record? Everything is inconvenient. Im currently in a tiny apartment about to get my car out of impound for $577 dollars. That should answer this question. The term for the album stems from inconvenience in relation to other people in one's life. Relationships. Record to record, Pregnant has varied in style/sound/execution. How does Inconvenience fit into the Pregnant oeuvre? Is it similar to any of the past albums? It is completely different. I have been making donation songs over the last nine months for people willing to donate $7 dollars or more. I have had a lot of practice after 49 songs in sample-based material and it sort of shines a light on that in this album. How did you hook up with Porch Party Records? I first met Zach Mabry in Long Beach from playing shows with him. Then through him I met Casey Terrazas and they eventually leaked the info to me about their budding record label. Things just fell into place. As part of your kick starter for the UK tour, you're offering a DIY handbook that you'll make along the way. Do you see it going beyond the initial Kickstarter lifespan, like are there plans to have it be guide be constantly growing and evolving to cater to the DIY scenes overseas? Any plans to build a website for it or place were it can be conveniently located? We will, even though Kickstarter suggested otherwise, build a website. And yes that is the aim, to start a collective site where video tutorials to (for example touring through Norway) are uploaded so that aspiring touring musicians can understand what to expect. We just have to do the foot work. Pregnant's Inconvenience LP is out in March on vinyl via Porch Party Records.